DKG specializes in the manufacture of high quality and complex machined parts. 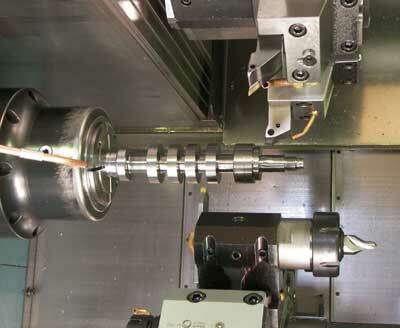 We utilize high precision CNC machine tools to accomplish amazing things. Lots of folks in the manufacturing world think that you have to go overseas to have anything produced these days. DKG is proof positive that the USA has not lost all of the manufacturing know-how and excellence for which this country has been so highly respected. To help satisfy the delivery and pricing needs of our customers, we focus very closely on the optimization of our processes. We take our responsibility as a manufacturer very seriously. Every job is important to us and we do everything in our power to become a trusted source for our clients to partner with. Without decent design work and documentation, modern manufacturing as we know it would not be possible. At DKG we can work with your mechanical drawings or CAD files. And if you don't have either of those we can reverse engineer from a current part, prototype or mockup to create the documentation needed to cut metal. If you've only got a concept or crude sketch, DKG offers a wide range of design services to turn your concept into a design. In many cases we will choose to create a 3D solid model from the drawings you supply to us. This step is chosen partly as a quality assurance step. The assistance solid modeling offers in checking clearances, range of motion parameters and aesthetics helps us to ensure that the part has the intended level of function, and looks the way you want it to. The Solid Model can then be imported into our Computer Aided Machining (CAM) software as the first step in generating a production program for our CNC machinery. There are many cases in which a pre-production prototype is necessary before a part is produced in quantity. This is especially important for new designs that must be tested and reviewed before heading to market. At DKG we can make the prototype for you as well as help you determine the best course to take for evaluation and testing. Production is where we really start making chips. We know how important every cent is when it comes to machining parts in today's highly competitive manufacturing world. We use every trick in the book and even some that aren't, to pump out parts in the most efficient manner possible. We take great care in planning the tooling requirements for every job. In many cases, we will make proprietary tooling that will allow for a significant increase in the output of our machinery while maintaining the high quality our customers have come to expect from DKG. And when you have DKG machine your parts for you, you can proudly claim that they are "Made in the USA"!